Between 2004 and 2010 BHTA field walked all the arable land in the parish of Bingham, some 868 hectares, and produced a history of settlement within the parish from the Mesolithic to the present. This project was funded by the Heritage Lottery Fund. Details of it are in the section Field walking. The story, however, was not complete because there was a 300-hectare data gap in the middle of the parish where Bingham stood and there was little archaeological information available about the built-up area. It was decided to explore the built-up area with a test-pitting project. A successful application was made to the Heritage Lottery Fund for a grant for a project entitled Roots and Development of Bingham. There were two parts to it: an archaeological survey of the town and a detailed study of some existing houses, including a dendrochronological study of several of them. The archaeological study is reported here. It involved digging 62 1-metre test pits in school grounds and gardens and three other larger excavations. Work started in November 2011 and finished in November 2015. The locations of the test pits are shown here. The main purpose of the project was to investigate the origins of the Bingham market town. There is a reference to Bingham in the Domesday Book, but there is no indication where it was. The field walking produced some evidence that there may have been an early medieval community based on Margidunum. So it was not clear that the original Bingham was where the town currently is. The southern margin of the lake that had stood in the northern half of the parish for thousands of years until Roman times was under built-up Bingham. As field walking had indicated that the Mesolithic hunter-gatherers lived on the margin of this lake, there was a possibility that Mesolithic flints might turn up in pits along this margin. The modern street layout in Bingham is a grid pattern similar to those that allegedly had Norman origins elsewhere. Some pits were sited to gain evidence of the first appearance of this street layout. It has long been suspected that there was a Roman villa where Carnarvon Primary School now is, and the school is situated close to what was thought to be a deserted medieval village. There was no clear evidence for what happened at the site of the villa when Roman rule ended in England. In addition to these the opportunity was taken with some of the pits to enable other less important questions to be addressed; for example, in relation to activity along the Fosse Way and with regard to the three windmills for which there is documentary evidence of their existence. Origin of Bingham village This is a narrative account of the conclusions of the project. List of test pits This and the link below are two ways to access detailed information directly from a list of pits. Test pits by key age Any of these three links will lead you to a summary statement about each of the 62 pits. Access to further information about the pits can be got from the summary statements. In the summer of 2016 a further eleven test pits were dug and they are reported here. Eight of the pits were dug in gardens along or closely adjacent to Long Acre. The purpose of these was to find if there was any evidence for the existence of this road before 1586, the year it first appeared in any documentation on Bingham. The reason for this was to examine the concept of Bingham being a planned medieval village. Three test pits were also dug in the garden at the back of the Chesterfield Arms. This was opportunistic. Permission to dig there was sought unsuccessfully in the first project, but in 2016 the pub was temporarily closed and the owners willingly gave permission for the digs during the time it was not open. We are grateful for Punch Taverns, who owns the pub, for their willing co-operation. List of test pits This link takes you to the summaries for the eleven test pits in Phase 2. From there you can go to the full descriptions. The narrative account of the Origin of Bingham village has been updated in the light of the findings from the new test pits as have all the diagrams and the Test pits by key age. The test pits were 1 metre square and were dug to the natural geological surface under the soil. Soil was removed in 10 cm layers and sieved. Everything of archaeological interest was taken out, washed, numbered and catalogued. These data were kept in and Access database and processed using ArcMap10 GIS and Excel. Most of the pits were dug in the historic core of Bingham and the ground was much disturbed by the earlier activity. 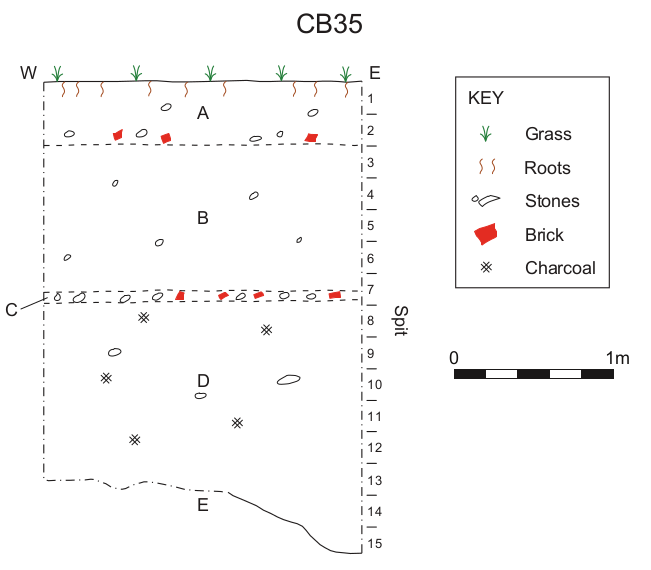 A fairly typical succession is represented by test pit CB35. A) Topsoil with bricks and other building material, which matches that in the structure of the building. It is not likely to be in situ, having been disturbed during building, possibly removed at the time the footings were laid and then re-deposited on completion of the work. It is organic and likely to have been worked as garden soil. B) In some pits there is a similar layer beneath the topsoil relating to an earlier building episode. Apart from the building material content, which will be earlier, this context may have been topsoil at the time the earlier structure was being put up. C) A layer of building material that relates to the demolition of an earlier building in order to redevelop the site. D) The natural soil profile shows gradual change from the weathered top of the basal geological unit (context E in Fig 3) upwards through subsoil, sometimes to organic topsoil. There is often a stratigraphy in this part of the pit, but there are few cases where the ground has not been disturbed by cultivation, either ploughing or digging. Consequently there is mixing of finds of all ages. However, an understanding of the archaeology of the pit can be had by plotting the total weight of any fabric types per 10 cm spit using Excel bar charts. Though it is usual for there to be something of this fabric type in all the spits through post depositional mixing, the appropriate time layer for it will generally show up because of a particularly high concentration of the fabric type. An example of one of the pits is shown in Fig 3. In Fig 3 there are three bar charts, all showing the weight in grams for selected categories of find. All of them occur throughout the sequence, but they start progressively higher depending on age. The single medieval sherd in spit 10 might have been misidentified, or it could have been brought down by moles. Animal burrows were commonly found in the pits. We are grateful, to the Heritage Lottery Fund for their grant to do this project. A large number of people contributed to the success of this project. Sylvia Aldworth, Duncan Allan, Joyce Allen, Geoff Ashton, Richard Barnett, Jack Beard, Jo Beard, Rowan Bird, David Boxer, Sue Brough, Povilas Cepauskas, Carolyn Chenery, Neil Cunnington, Sarah Deacon, Sam Dixon, Doug Downing, Carol Dunn, Shannon English, Chris Evans, Cherl Gallimore, Colin Glover, Ellie Graham, Patrick Hallam, Peter Hammond, Rex Harland, Jane Harper, Adrian Henstock, Val Henstock, Jerry Hefford, Sue Hodson, Pauline Hollands, David Ingham, Jim Johnson, Elaine Kazimiercuzk, Andrea Kelly, Meghan King, Diana Mackintosh, Carole Matthews, Spencer Nicholson, Ann Packwood, Angela Parker, Frazer Patten, Bethan Patten, John Perry, Veronica Perry, Jim Priest, Rose Rennie, Pam Richmond, Trevor Richmond, Tina Roushannafas, Mike Rowlinson, Sally Sanderson, Hilary Sentance, Alison Sharp, Margaret Sibley, Debbie Smith, Kris Szpakowska, Bob Terry, Wynne Thompson, Annemarie Wheat, Kim Whittle and Ray Wilcox. Joan Ashton coordinated the finds washing and curation. Geoff and Joan Ashton together did most of the data entry. Finds were identified by David Knight (Iron Age), Ruth Leary (Roman), Jane Young (Anglo-Saxon to Saxo-Norman), Vicki Naylor (medieval), Adrian Henstock (stoneware and modern), Peter Allen (post medieval and modern), Peter Hammond (clay pipes and glass), Neil Cunnington (metal), Elaine Parker (bones and teeth). Geoff Ashton examined and measured the bricks. Graham Lott identified the limestone roofing tiles and Tony Cooper brought his expertise in gypsum to the study of the gypsum plaster and lime floor. Trent and Peak Archaeology provided oversight of the whole project with David Knight and Laura Binns each making a special contribution. Peter Allen managed the project. Special thanks are due to the many householders who allowed work to be done in their gardens. Without their willing co-operation there would have been no project.